During Star Wars Celebration in Orlando, Florida it was announced that Captain Phasma will be receiving her own comic book series from Marvel Comics this September. The comic book will be a prelude story for Star Wars: The Last Jedi in theaters this December. Kelly Thompson (Hawkeye) will be writing the series and Marco Checchetto (Spider-Man) will be doing the pencils for the book. In a press release Thompson said, “It’s exciting enough when someone lets you contribute to the ‘Star Wars’ universe in any real way, but when they let you create the first ever Phasma story for comics? Well, that’s about as good as it gets! Like most, I’m a huge fan of both Gwendoline Christie and Phasma. Christie is magnetic and Phasma has so much fascinating untapped potential…potential which I can’t wait to help unlock for fans in our comic.” Are you excited for this comic book? Do you think there are too many Star Wars titles at Marvel? 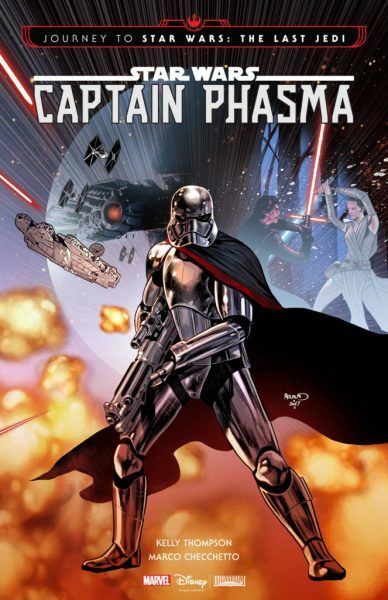 What do you want to see with this Captain Phasma book? Let us know your thoughts in the comments!